This handbook is part of the project ‘Strengthening of emergency response capabilities with emphasis on differently abled people’ launched by Kerala State Disaster Management Authority (KSDMA). As people with disabilities (PWD) are highly vulnerable to various kinds of disasters/emergencies, this project is designed to ensure the safety of those who are PWDs. The project envisions a safer state for PWDs by building their capacity towards disaster preparedness, risk reduction, response, and rehabilitation. 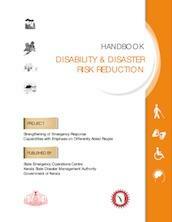 To reduce the risks and enhance resilience of people with disabilities towards disasters. To build the capacity of the people with disabilities and their caregivers to prepare and respond to any emergencies. To reduce the vulnerability of people with disabilities to natural & anthropogenic hazards by enhancing their participation and inclusion in disaster management activities. To enhance the capacity of the stakeholders engaged with disability and disaster risk management towards disability inclusive disaster risk reduction. This handbook would be useful for persons with disabilities, facilitators, trainers, students, teachers, practitioners and academicians who work for the cause of persons with disability or disaster risk reduction. Number of pages/running time 112 p.